Google Search for Android has been updated and the app includes a lot of new Google Now cards. There are cards that use search history data (developing news stories, stocks, concerts, movies), location data (nearby attractions and popular photo spots), but there's a new source of information: your Gmail messages. Google Now checks your email and tries to find confirmation messages for restaurant reservations, hotel bookings, flights, events you purchased a ticket for, online orders. This way, Google can show notifications and useful information without having to manually add events to Google Calendar. For example, package tracking is now a lot more convenient and you don't have to use a separate app or subscribe to email notifications. Gmail's desktop interface shows useful links related to your messages: Google Maps for addresses, package tracking links, "add to calendar" for events. Google Now takes this to a new level: sidebar links become smart cards that trigger notifications. Obviously, the cards are generated automatically by Google's software and no Google employee reads your email. 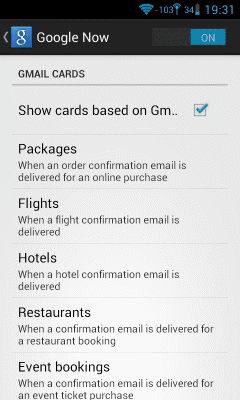 If you don't like the new cards, you can disable them from the settings (the "Google Now" section). Google Search for Android also brings new voice actions: you can create new events, check your schedule and launch apps. At the moment, Google Now requires Android Jelly Bean and the Gmail integration is only available in the English interface. I LOVE Google now and voice actions. I use them multiple times daily. I still don't know what they're waiting for when it comes to adding an item to calendar using voice actions/commands. It is now possible. You can say something like "add event to calendar for halloween on october 31"
I got all the updates for google now, but not the google mail analysis. maybe it's not avaible in germany. I tried everything I could think of to launch an app with a voice command, and couldn't figure out the magic phrase. Asking for help took me to a non-existing help topic on the google website. 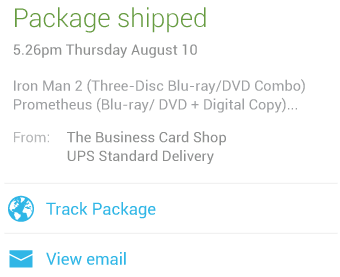 Funny how Google Now didn't pick up on delivery information for a Nexus 7 ordered from Google Play. Wish there was a way to use other email accounts. I have GMail, but this is not where most of my email goes. great..i would love to have an id card in google..i have used gmail for 3 months..maybe i should try to inform about it.. The package tracking card has never worked, not even a single time. This appears to be a very common problem, though it appears that no fix will be released any time soon. There also do not appear to be any troubleshooting steps possible from the user's end - if there are I haven't found any. why is it not working on different languages?